Transform any occasion into something special with the atmospheric glow of candlelight with the help of one of our dramatic yet stylish designs. 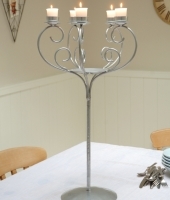 Choose from the long armed opulence of our candelabras, the ideal way to create a regal entrance at weddings and special gatherings, or our elegant range of table top tea light holders, perfect for dinner parties and indoor entertaining. With a variety of both vintage and contemporary inspired stands, there is something for every home and setting within this delightfully diverse range of lighting solutions. Lend a touch of romance to lounge areas, or unrivalled ambience in the dining room.